I think it's a well know fact that the ratio between those looking for great Malaysian food and those selling great Malaysian food is quite heavily balanced in favour of the former. It always intrigues me why there is so much interest in food from the Straits, but I guess the unique balance of Indian, Malay and Chinese flavours make it quite an intriguing proposition. Having Chinese Malaysian parents, I have had plenty of exposure to the food, and often crave a good roti canai or a smoky char kway teow. With no really good locations selling Malaysian food in London (IMO), the itch often remains unscratched. Kiasu was good, before it got allegedly closed down for health violations, and Awana do make good, if pricy rotis, but the choices are few and far between. So on a recent lunch jaunt to Kopi Tiam with Catty, I wasn't expecting much but left pleasantly surprised. Even though the drinks there are outrageously expensive (£2.50 for a teh tarik / sweet milky tea, 50p more for ice! ), it seemed to have all the favourites which is always a good start. An order of roti was a no brainer, but deciding on what to have for my main was a lot more difficult. In the end, I opted for the handmade Hakka mee, although the draw of Hainanese chicken rice was very strong. Cat went for the char kway teow, so we got to road test that too. 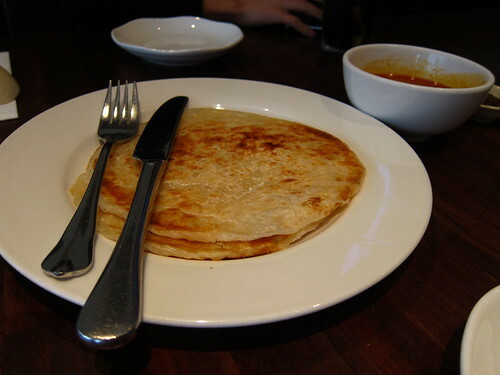 The roti itself were nice enough, although I found them on the thin and overly crispy side. I like mine slightly fluffy so they weren't perfect, but tasted good, and the curry to dip the roti in had a decent depth of flavour, if a little thin for my liking. The mains were also pretty good. 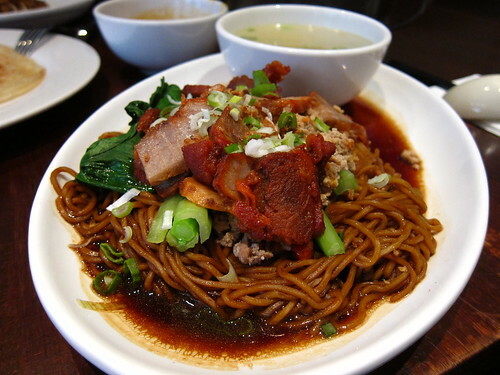 The hakka mee came with THREE types of pork, and in my books, that's already onto a winner. The sauce was slightly salty, but the pork mince and char siu were nice enough. A small bowl of wanton soup rounded off a pretty huge but satisfying lunch. Having a few tastes of Catty's char kway teow, I was pleased to come across the little lumps of fried pork fat that often run through this dish in versions I have had in Kuala Lumpur. This made me very happy and automatically gave it a few extra points from me. Although lacking a depth of smokiness imbued by a hellishly hot wok, it was filling and moreish. I left pleased and full, a mere tenner less in my pocket. Kopi Tiam is good if not that outstanding, and I for one am pleased to have it so close to work. 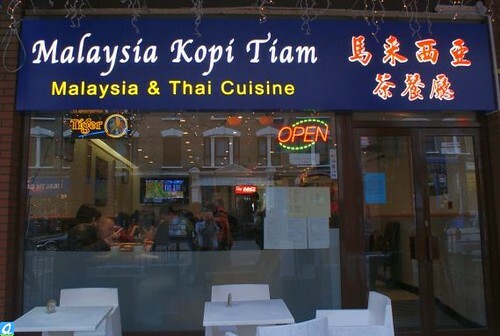 I don't think we will ever get that great Malaysian restaurant in London. Much of the places where you get dishes out in the homeland are specialised and cooked to order in front of your very eyes, the focus and dedication is often what makes it great. I live in hope, but in the meantime, this place will have to do. 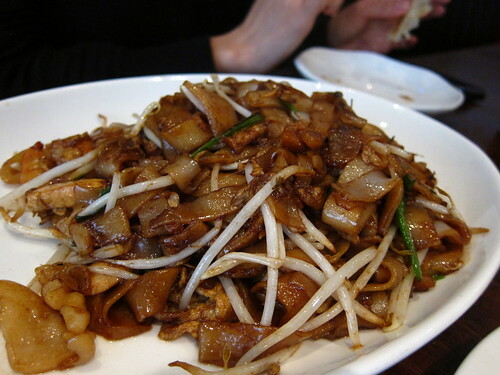 @ Lizzie - It does break my heart when I pay more than a pound for an amazing plate of char kway teow. Nice one - cheers for this. Must get down there soon, i'm craving sambal! There is a good malaysian in High Barnet- far end of the Northen line, their Mee Goreng and Laksa are pretty good, but sadly no roti canai or char kway teow but worth a visit if you are craving some proper Laksa! Thanks for helping me with my pregnant cravings for roti... know where I am dragging my other half this afternoon! Try Singapore Garden in Swiss Cottage. PDG. The roti in these places are usually the frozen ones you can get in the Chinese supermarkets. Not that they're not tasty mind. Just saying. I actually liked the roti - thin and crispy. Went for their assam laksa - especially cooked for take away folks who are abel to take Sundays off - it was a huge disappointment - lacked flavour, lacked mint - and the wrong noodles.